When your opponent's monster declares a direct attack: You can Special Summon this card from your hand, then end the Battle Phase. If this card is Special Summoned with this effect, banish it when it .. When this card is Normal or Special Summoned: Place 1 Guard Counter on it. This card gains 300 ATK for each Guard Counter it has. Once per turn: You can target 1 other face-up card you control; remove.. If this card is discarded to the Graveyard by a card effect: Special Summon this card from the Graveyard to your opponent's side of the field in face-up Defense Position. When this card is Special Sum.. 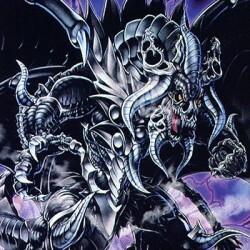 Tribute 1 DARK monster with 2000 or more ATK; check your opponent's hand, all monsters they control, and all cards they draw until the end of their 3rd turn after this card's activation, and destroy a.. Tribute 1 DARK monster with 2500 or more ATK, and choose Spell Cards or Trap Cards; check your opponent's hand, all Spell/Trap Cards they control, and all cards they draw until the end of their 3rd tu.. If this card is discarded to the Graveyard by a card effect: If it was discarded from your hand to your Graveyard by your opponent's card effect, you can target up to 2 cards your opponent controls: ..
You can Special Summon this card (from your Graveyard) by returning 1 face-up "Dark World" monster you control to the hand, except "Grapha, Dragon Lord of Dark World". If this card is discarded to the.. If this card is discarded from your hand to the Graveyard by an opponent's card effect: Special Summon this card from the Graveyard. When this card is Special Summoned this way: Destroy all monsters y..